Secure Cloud is an IaaS service that allows users to build their own virtual data center. The service is based on well-known VMware vCloud, with an AirVM portal for an enhanced user experience. 24 Solutions can hence provide a cloud service that you access through a user-friendly portal where you, instead of investing in hardware and maintenance, create servers according to your needs. For example, you easily control e.g., RAM, CPU, disk size, processor, storage, firewall, network configuration, in the portal. Once complete, you can manage your own operating systems and applications in the cloud. 24 Solutions manages the infrastructure behind the scenes so that you don’t need to, e.g., assign staff resources or invest and maintain hardware. 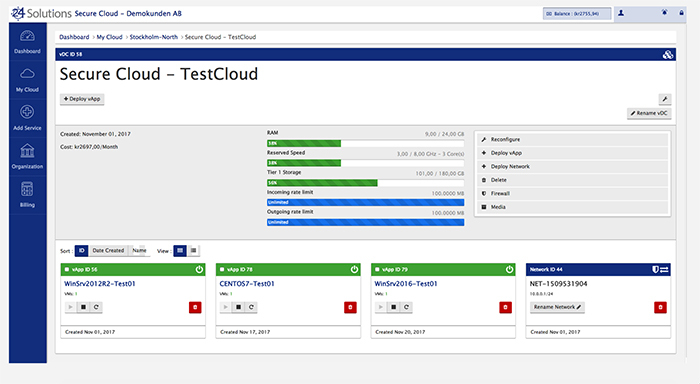 Secure Cloud is equally suitable for more short-lived test and development servers as it is for production servers that require a stable, safe and scalable platform. With Secure Cloud, you use infrastructure that is operated from some of the country’s safest data centers. 24 Solutions’ datacenter offers full redundancy and is located in Sweden, which means your data never leaves the country. This has many advantages, not the least when it comes to complying with regulations such as GDPR. Unlike many other online services, 24 Solutions’ Secure Cloud can be combined with more traditional hosting services – contact us today and we’ll work with you to address your specific needs. By placing all or part of your IT environment in 24 Solutions’ Secure Cloud, your business becomes more flexible, scalable and efficient. 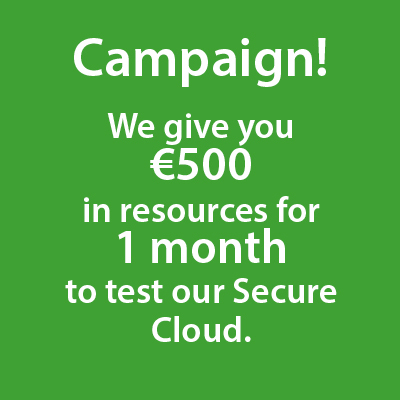 Do you want to try out Secure Cloud? Do you want to know more about Virtual data center?